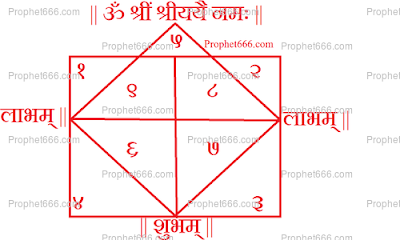 The Laxmi Mata Vyapar Vriddhi Yantra, which, I have described in this post is said to be helpful for those businesses, which are undergoing losses and stagnation due to any kind of Black magic or malefic Tantra cast by any Tantric or Spell Caster. This Laxmi Yantra for business growth clears the harmful vibrations emitting due to the Black magic and attracts positives vibrations, which are helpful in putting the business back on track. 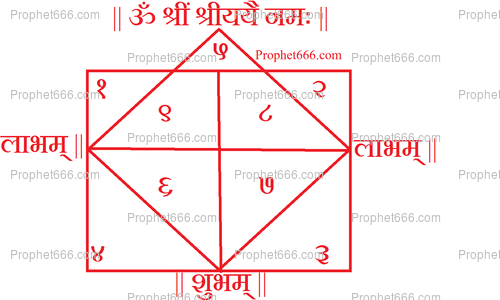 This Vyapar Vriddhi Yantra is believed to give the best results is prepared on the night of Diwali. It has to be prepared by drawing it is shown in the image on a Bhojppatra with the paste of Kesar [Saffron Sticks] and written with pointed gold pin or any other pointed thing made from gold. Then the Laxmi Mantra – ॐ श्रीययै नमः || Om Shriyayai Namah || has to be chanted 51,000 times. A Lotus Seeds Counting Rosary is best suited for this Mantra. Then the Yantra should be worshipped with offerings of sweet smelling flowers, incense stick and the lighting of an oil lamp. After this, the prepared Yantra has to be put inside a photo frame or laminated and placed on the wall of the shop, office or business premises. The Yantra should be kept clean and dust should not be allowed to accumulate on the Yantra. can this yantra be laser ingrave on gold, silver or coipper before diwali then do the worshipping and mantra chanting at Diwali ? what position the yantra should be hang ? yantra to b kept in which direction. As mentioned the Yantra gives the best results if the procedure mentioned in the article is followed. The Yantra should be placed in a position which faces the main door or entrance and is not obstructed in any other item. Do 51000 chants we should do in one go or we can complete in few days?